The 20th Annual Conference of the International Speech Communication Association INTERSPEECH 2019 will be held in Graz, Austria, from Sep. 15-19, 2019. Carstens Medizinelektronik and the AG501 will be present. The Interspeech 2017 will be held from August 20th to 24th in Stockholm, Sweden. We are delighted to inform you that a new Online meeting on the “Post Processing of AG501 Data” will take place on the 17th February 2017. Using the real time display with contours. for more information about the Meeting and how to join the meeting please read the following Pdf file. The Answers of the past meeting in the pdf file. Another Web meeting is planned in February 2017, for subscription please contact Bahne . Carstens Medizinelektronik will be present. 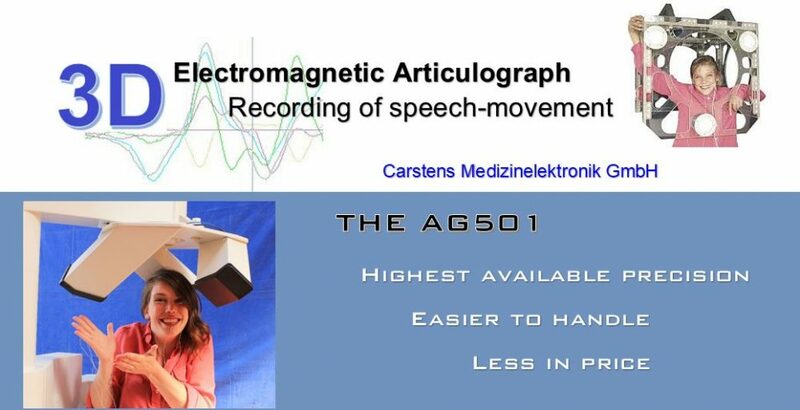 More than 5 years after the last AG500 was delivered Carstens Medizinelektronik releases a software update for AG500 users. Some of the software enhancements of the AG501 were backported to the AG500.